More infants die every year in accidents involving cribs than with any other nursery product. Thousands of infants are injured seriously enough to require treatment in hospital emergency rooms. Corner posts should not extend more than 1/16 inch (1 1/2 mm) above the top of the end panel. Corner posts can be catch points for items placed around a child’s neck or clothing worn by the child. Mattress support hangers should be secured by bolts or closed hooks. All crib hardware should be securely tightened and checked frequently. Bumper pads, if used, should (a) fit around the entire crib, (b) tie or snap into place, and (c) have straps or ties at least in each corner, in the middle of each long side, and on both the top and the bottom edges. To prevent your baby from becoming entangled in the ties, trim off excess length after tying. Use the bumpers until the baby can pull up to a standing position, then remove them so that the baby will not use them to try to climb out of the crib. Remove and destroy all plastic wrapping materials. Never use plastic bags as mattress covers. The plastic film may cling to a baby’s face and cause suffocation. CPSC discourages the use of used cribs. Use a crib that meets Federal safety regulations and industry voluntary standards (ASTM) and that has a tightly-fitted mattress. Check the labeling on these products to make sure they meet safety requirements. Check the crib and replace any missing parts, such as screws, bolts or mattress support hangers, before placing your child in it. Make sure all screws or bolts are securely tightened. Any screw inserted into a wood component that cannot be tightened securely should be replaced by one that fits. On cribs where the mattress support is suspended by hangers attached to hooks on the end panels, check frequently to be sure they have not become disconnected. Never use a crib with broken or missing parts. Use a mattress that fits tightly. If you can fit more than two fingers between the edge of the mattress and crib side, the mattress is too small. An infant can suffocate if its head or body becomes wedged between the mattress and the crib sides. Avoid older cribs with headboard and footboard designs that may allow an infant’s head to become caught in the openings between the corner post and the top rail, or in other openings in the top edge of the headboard structure. These openings may lead to strangulation. Corner posts should be less than 1/16 inches high. (1-1/2 mm) unless the crib has a canopy. Do not use a crib that has decorative knobs on corner posts. If you already have a crib with such knobs, the knobs should be unscrewed or sawed off flush with the headboard or footboard. Sand off splinters and sharp corners. Never use a crib that has loose or missing slats. Be sure that all slats are securely fastened in place and the space between slats is no more than 2-3/8 inches (60 mm) to avoid head entrapment/strangulation. If you paint or refinish the crib, use only high-quality household lead-free enamel paint and let it dry thoroughly so there are no residual fumes. Check the label on the paint can to make sure the manufacturer does not recommend against using the paint on items such as cribs. To reduce the risk of Sudden Infant Death Syndrome (SIDS) and prevent suffocation, put your baby to sleep on his/her back in a crib on a firm, flat mattress. Make sure there is no soft bedding underneath your baby. Temporary beds: Never place your infant to sleep on an adult bed, waterbed, or bunk bed. Infants up to 18 months can suffocate in their sleep when their bodies or faces become wedged between the mattress and bed frame or the mattress and wall. Never put a crib, child bed, or furniture near window blinds or drapery. Children can strangle on window cords or fall through screens. If local fire codes permit window guards, install them. Make sure all drapery or window blind cords are out of a child’s reach. CPSC receives numerous reports of strangulation deaths on window blind cords. To keep cords out of reach of children, use tie-down devices, or take the cord loop and cut it in half to make two separate cords. Consumers can call 800-506-4634 or visit windowcoverings.org/20.html to get free repair kits. Never use strings to hang any object, such as a mobile or a toy or a diaper bag, on or near the crib where a child could become caught in it and strangle. If you have toys with cords or elastic for hanging, cut the strings/cords off. To prevent strangulation, NEVER tie pacifiers/teethers around your child’s neck. Remove bibs and necklaces whenever you put your baby in crib or playpen. Always lock the side rail in its raised position whenever you place your child in the crib. As soon as your child can stand up, adjust the mattress to its lowest position and remove the bumper pads. Also, remove any large toys— an active toddler will use anything for climbing out of the crib. When your child reaches 35 inches (890 mm) in height, he/she has outgrown the crib and should sleep in a bed. Never use plastic bags as mattress covers. The plastic film may cause suffocation. Check all crib hardware; tighten all nuts, bolts, and screws frequently. After a crib is moved, be sure all mattress support hangers are secure. Check hooks regularly to be sure none are broken or bent. Open hooks may allow the mattress to fall. 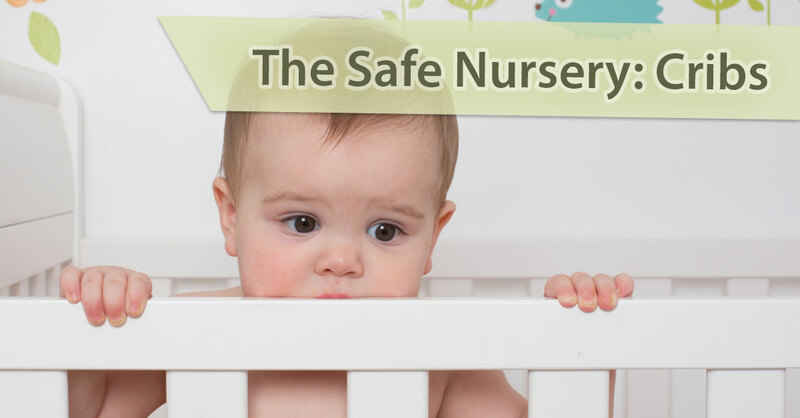 The above is an excerpt adapted from the article, “The Safe Nursery.” For more information, please visit www.cpsc.gov.